READER>> What is your view of eschatology? ME>> Eschatology is one of the most difficult and dividing sciences in Christian theology. Eschatology is the part of theology concerned with death, judgment, and the final destiny of the soul and of mankind. Eschatology is simply the study of future good news! The challenge is understanding and interpreting Biblical prophecy about the future of mankind's redemption. The bold claim of the Optimism Out of Control book is the complete and final salvation of all mankind. This claim, if reasonable, must then be consistent with Biblical prophecy about the future of mankind's redemption. So how and when will Jesus return? What future hope remains for mankind's redemption? G. Campbell Morgan wrote God's Methods with Man. He and many others have designed various charts of the history of redemption. Motivated by these charts and studying the Bible, I propose my own chart of the history of redemption below. The literal 1,000 year epoch remains still future. Christ will return physically to inaugurate the Millennial Kingdom. Old Covenant worship will be revived to fulfill Old Testament prophecy. Commended for insisting there is future hope for ethnic Israel. Anti-Christian for reviving the Old Covenant after the glorious New Covenant. Endorsed by Darby, Scofield, Ryrie, and others. Christ will reign on earth as New Covenant King to further demonstrate grace. Commended for not reading external meaning into Biblical symbols. Can neglect the relevance of Old Testament symbols and first century context. Endorsed by Spurgeon, Schaeffer, Erickson, and others. The figurative 1,000 years from Christ's first to second advent, the Church Age. Christ will return after the Church Age to inaugurate the New Heavens and Earth. Christ reigns from Heaven now and will reign physically on earth then. Commended for navigating toward the simplest sensible model. Yet if Isaiah 65:20 is the final New Heavens and Earth why is there death? Endorsed by Augustine, Hoekema, Riddlebarger, and others. The literal 1,000 year epoch was the Church Age to the Great Schism, 1054 A.D..
Christ will return in the future to inaugurate the New Heavens and Earth. Commended for similar simplicity with A-Millennialism. Stretches the timing of Revelation 20:7-15 from 1054 A.D. to Christ's return. Endorsed by some Roman Catholics and others. Christ reigns through Gospel Victory to usher in the Millennial Kingdom. Christ will return after the Millennium to inaugurate the New Heavens and Earth. Commended for great hope and optimism in the power of the gospel. Can neglect that gospel progress proceeds at the pace of God's choosing. Endorsed by Calvin, Boettner, Rushdoony, and others. Partial Preterism like Christ's judgment on Jerusalem in 70 A.D., Matthew 24:15. Prophecies about repentant Israel's special roles still future, Isaiah 66:12. Optimistic, pessimistic, or realistic outlooks for the temporal future. Ranges of Biblical interpretive methods from literal to symbolic. Short and long range prophecy as well as dual fulfillment, Matthew 24:3. The 1,000 years is the figurative span from Christ's first advent to 70 A.D..
Christ's second coming was his judgment on Jerusalem in 70 A.D..
Christ reigns as king in Heaven with no future physical coming prophesied. Commended for observing that prophecies may already be fulfilled. "Blessed Hopelessness" for saying that all prophecy is already fulfilled, Titus 2:13. Endorsed by Alcasar, Preston, Harden, and others. The views above are listed on a continuum from Old Testament promises not yet realized to New Testament promises completely realized. The Dispensational and Full Preterist views are understood to fall outside of Christian orthodoxy. Yet since eschatology is such a difficult subject matter Christendom has been more or less accommodating to each of the other views. A more thorough study and explanation could take volumes and even after studying numerous volumes myself I find it hard to determine the matter with the confidence I would prefer. Ezekiel confronted the pride of the King of Tyre prodding that he was "wiser than Daniel." Yet Daniel had the wisdom to confess after receiving prophetic visions, "I heard, but I didn't understand," (Daniel 12:8 WEB). I confess that I hear, but do not understand as clearly as I would prefer. Yet Jesus still urges us, "let the reader understand," (Matthew 24:15 WEB). So we seek understanding. In the end I am convinced that my primary thesis, that all mankind will be finally saved, can be consistently integrated with many of the proposed views above. Though one's understanding of Jesus' words "this age", "the age to come", and "the ages to come" will of course be different according to one's preferred framework. We also know that conflicting frameworks cannot all be right. Certainly all of the proposed models above miss the mark to some degree, some more and some less. This is unsettling. I wish I could add a more definite view of eschatology to the defense of my thesis. Yet, even so, my list of proofs in the body of Optimism Out of Control are more than sufficient evidence of God's love for all mankind, at least enough evidence for me. That said, I will share my current understanding about Christ's promised return in order have greater appeal to my reader through my transparency. As a simple church goer I held the Pan-Millennial view, that is it would all "pan out" in the end. I still hold this view! After coming to faith I initially held to the Non-Dispensational Pre-Millennial Future understanding. Then, frankly while working on this book I moved to the A-Millennial or Church Age understanding. The good news is that the next major event anticipated for both of these views is the return of Christ. So whatever confusion remains now will certainly be cleared up then! Since my understanding has recently changed I ask your patience if you discover inconsistencies in my words. Several observations have pointed me to the A-Millennial or Church Age model of understanding. First, Revelation 20:1-6 does not say anything about the Millennium being a supernatural time of peace, but simply that Satan is restricted from deceiving the nations. Since 1 Peter 5:8 warns us that Satan is prowling around seeking to devour individuals, Revelation 20:3,8 could simply be saying that Satan is restricted from rallying the nations against Christ's people. Second, Isaiah 65:17-25 and 66 are explicitly prophesying about the New Heavens and Earth, not a Millennial Kingdom. Admittedly Isaiah 65:20 does not appear to fit the New Heavens and Earth because of its mention of child birth and death. However, the explicit identity of this forecast is not the Millennium, but the New Heavens and Earth. Third, Ezekiel's temple and the river that flows from it are clearly a picture of the infinite love, grace, and mercy found in Jesus Christ. A literal display of Ezekiel's temple and river would not even fit on the planet! Models that insist in the revival of Old Covenant temple worship to satisfy Ezekiel's and other Old Testament prophecy have missed the main point of the book of Hebrews. These models also miss the Holy Spirit's use of Old Testament symbol hyperbole to point to the glory of Christ's first advent. Fourth, Matthew 24:3 lists two or three questions from the disciples. Thus, it is no stretch at all to see that Jesus' answer includes both partial preteristic statements about his coming judgment on Jerusalem in 70 A.D. as well as his second coming in glory as reigning king at the end of the Church Age. Fifth, Jesus warns that blasphemy of the Spirit in Matthew 12:30-32 will not be forgiven in "this age" or "the coming." Universalists commonly understand that unbelieving humans will suffer in the "coming age" of the Lake of Fire, but then eventually be saved even from there. Since, I hold that humans will never enter the Lake of Fire then what is "the coming" age? As a Pre-Millennialist the answer was the coming Millennial Kingdom. However, now as an A-Millennialist "this age" could instead refer to the end of the Jewish Age, while "the coming" is the Church Age. Sixth, the living, reigning, and first resurrection of the saints in Revelation 20:4-5 is often understood to be the physical resurrection at a Pre-Millennial rapture. However, the passage is just as easily understood to be the spiritual resurrection to new life as a Christian. Also the Holy Spirit is encouraging us that Christians who are terribly martyred have not lost, but are victors in Heaven until we will meet them again in glory. Seventh, while Preterism makes essential points that Christ did come in judgment on Jerusalem in 70 A.D., Full Preterists make a gross error negating Christ's promise to return in the body to consummate the marriage to his bride, John 14:3 and Acts 1:11. So reasonable explanations can be found for the A-Millennial Church Age understanding while defending the universal salvation of all mankind. Below is my proposed chart of redemptive history with twelve categories of people, eight ages of redemptive history, and the location of these people during each era. Please note that I do not list twelve and eight divisions as if they were special numerical divisions as some forms of Dispensationalism attempt. Instead these categories are simply for illustrative purposes. 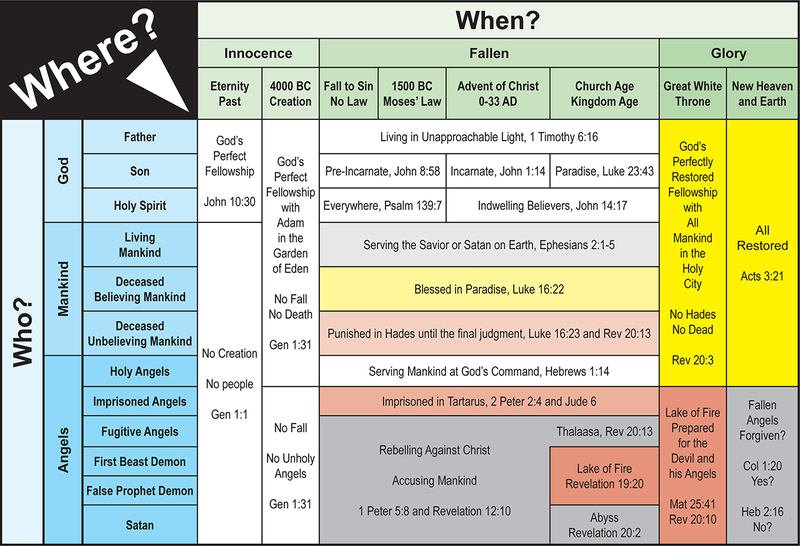 The chart shows the distinction between the redeemed and the unredeemed, that is mankind versus fallen angels, as explained in my article, Revelation 20:10. The chart below also shows the distinction between Hades, Tartarus / Thalaasa, and the Lake of Fire, that is temporal punishment versus damnation for The Ages of The Ages, as explained in my article, 2 Thessalonians 1:6-10. Understanding this is a great hope for those trusting that Christ has paid for the sin of all mankind. The chart is complex. For the best reading strategy choose a category of people and follow their location horizontally across the ages of redemptive history. Alternatively choose an age of redemptive history and consider the locations vertically down the categories of people. Do you know where you are? Do you know what time it is? First, Hades, Tartarus / Thalaasa, and the Lake of Fire are not the same place according to Luke 16:23, 2 Peter 2:4, Jude 6, and Revelation 20:13-14. Furthermore, both Hades and Tartarus / Thalaasa, a prison for demons being held for future judgment, are temporary locations, emptied of their unbelieving human inhabitants as well as their imprisoned demons at the Great White Throne Judgment. Punishment in Hades is distinct from condemnation in the Lake of Fire because Hades is for an Age whereas The Lake of Fire is for The Ages of The Ages. Punishment in Hades is also distinct because God cares for the unbelieving humans punished in Hades (Psalm 139:8 and 1 Peter 4:6). However, God does not appear to care for Satan (Genesis 3:15 and Hebrews 2:16), and damns fallen angels to the Lake of Fire for The Ages of The Ages (Matthew 25:41 and Revelation 20:7-10). Second, Christ has redeemed all mankind, believing and unbelieving, as the second Adam, our vicarious substitute. (See Romans 5:12-21, Romans 11:32, and 1 John 2:1-2.) However, he has apparently not redeemed fallen angels (Hebrews 2:16). Third, faith does not cause redemption, but faith receives the redemption already given at the cross by the death of Christ (Romans 5:10). Faith is repentance from self-righteousness to receive Christ's righteousness already given (Romans 1:17 and Ephesians 2:8). Free will choice is not the condition to God's unconditional love, but a changed heart is happy to trust in God's unconditional love (John 3:3). Fourth, the believing redeemed will join Christ in paradise after death (Luke 23:43) and will be resurrected at Christ's return to rule with him again on Earth (1 Thessalonians 4:16-17 and Revelation 20:4). The unbelieving redeemed will suffer in Hades if they do not repent from their self-righteousness and receive grace through faith (Luke 16:23 and 2 Peter 2:1), and apparently they will stay in Hades until the Great White Throne Judgment (Revelation 20:5). Though 1 Peter 3:18-20 and 4:6 might suggest that new life can be realized even for some in Hades. Christians and perhaps all mankind will also need to stand before Christ at the Bema Seat Judgment as explained in Romans 14:10-12 and 2 Corinthians 5:10. I am not sure of the timing of this event or whether it is a personal or group interview with Christ. We should make ourselves ready. Fifth, the Lake of Fire, the second death, is prepared for the Devil and his Angels, not Mankind, as explained in my article, Matthew 25:31-46. Furthermore, it is wrongly assumed that the judgments in the Bible are for humans only and divide believer from unbelievers, when instead some of these judgments include both humans and fallen angels and divide the sheep from goats (Matthew 25:41, 2 Peter 2:4, Jude 6, and Revelation 20:7-15). Some conclude that even Satan and his Angels will be redeemed based on the "all" of Colossians 1:20. This is a small difference with my understanding. We all can see that the pages of the Bible end with those named in the Lamb's Book of Life enjoying God's presence for a blessed eternity. I and many others have also argued that those finally saved are all Mankind by means of Christ's atonement (1 John 2:1-2 and Revelation 20:15). The pages of the Bible also end with Satan's head crushed, as promised in Genesis 3:15, and with the fallen angels cast into the Lake of Fire for The Ages of The Ages (Revelation 20:10). If grace is ever extended to Satan, it is not explicitly stated in the Bible. Obviously the chart above is fairly comprehensive, but it does not include every concept. For example at one point in history Satan had direct access to God's throne (Job 1:6) but at another point in history he is denied this access (Revelation 12:7-12). Sixth, Peter said in Acts 3:21 (WEB), "whom heaven must receive until the times of restoration of all things, which God spoke long ago by the mouth of his holy prophets." The Greek word translated as "restoration" is "apocatastasis" which Thayer's Greek Lexicon defines as, "the restoration of that perfect state of things that existed before the fall." Ilaria Ramelli and David Konstan point out in Terms for Eternity: Aionios and Aidios in Classical and Christian Texts that "aion," typically translated "eternal" in the English New Testament, instead generally means "age" or "eon." They also note that the definitive Greek word for eternal, "aidios" is only used twice in the Bible: once in Romans 1:20 concerning God and once in Jude 6 concerning the bonds on fallen angels. Since Ramelli and Konstan argue even for the salvation of Satan they conclude that "aidios" in Jude 6 must mean transcending the ages, but not finally eternal. They reason that these demons are being "held for judgment" and thus there must be an end to these "aidios" bonds after their judgment. However, it could also be that these demons with "aidios" bonds are held in Tartarus / Thalaasa to be extracted for sentencing at the Great White Throne Judgment and then with the "aidios" bonds still on they are cast into the Lake of Fire. Thus they are held for judgment, but the "aidios" bonds are not released as they are cast into the Lake of Fire. This is one data point for the argument that fallen angels are eternally damned. Further, if the Sheep and Goat Judgment of Matthew 25 is synonymous with the Great White Throne Judgment of Revelation 20 and with the Great Judgment Day of Jude 6 for the imprisoned angels, then it is clear that the goats are held for judgment and further sentenced to the Lake of Fire. So the "aidios" bonds do not end at the Great Day of their judgment, but continue further. How much further? Is the "apocatastasis" fulfilled with the final salvation of mankind at the Great White Throne Judgment? Or is there further fulfillment of the "apocatastasis" with the salvation of the Devil and his angels sometime after The Ages of The Ages beyond the pages of Scripture? The point is that our lover, Jesus Christ, is currently away, but he is returning and has told us many things about his future plans to "make his enemies a footstool" and to return for his bride, the church, and to consummate eternity with the final salvation of all mankind. Biblical Christianity offers great hope for mankind! Do not settle for anything less!